I decided to include this hike as a separate hike even though it is on the Eagle Creek Trail. There are many outstanding destinations on this trail, and most are covered on Hike 37. This hike begins at the Eagle Creek Trail head and follow the trail for about a mile and a half. Going upstream there are not clear markings indicating that you have arrived at the cutoff trail that takes you to the overlook for Metlako Falls. However, after you pass the cutoff trail, you will come to a sign on a tree indicating the trail to the Metlako Falls overlook. Its but a short back-track, so its no big deal. 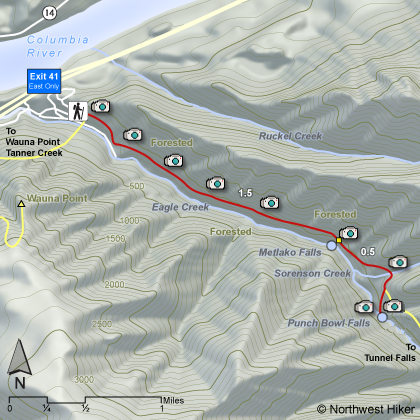 After enjoying Metlako Falls, just return to the main Eagle Creek Trail and continue upstream. 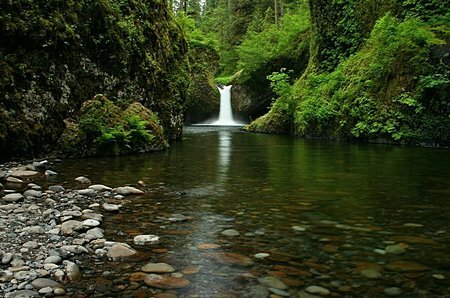 You will soon cross a small creek, and then come to the cutoff trail that leads down to Eagle Creek and an area just below Punchbowl Falls. This is the way to truly enjoy this marvelous falls. The trail descends steeply to Eagle Creek, and if the creek is low you can walk to a place upstream where you can view Punchbowl Falls from creek level. If the water is high, do NOT UNDER ANY CIRCUMSTANCES try to wade to a point where you can view the falls. High water is too dangerous. This falls can be viewed from the Eagle Creek Trail. Actually, after this side trip, just walk back up to the main trail, and follow it just a bit further upstream to the overlook for Punchbowl Falls. Traveling eastbound on I-84, take Exit #41. At the bottom of the ramp turn right. Go about 1/2 mile to the end of the road. You will go past a footbridge (that takes hikers up to Wauna Viewpoint) as the road narrows to one lane. Continue a short ways to a large parking lot; park only in designated spaces. NW Forest Pass required.